No blog for this project. Many of the teachers have told us that they were surprised at how much they enjoyed the show, “maybe even more than the kids,” said one. In ”The Fantazmagical Rogers and Burgundy Show ”, we had so much fun trying to catch and then turn our little volunteer into a horse, the kids seemed to enjoy the the bloops, stumbling blocks and even a little “real magic” that we encountered along the way. 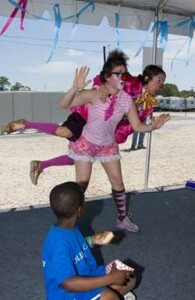 We were interviewed by a couple local newspapers and a local radio station, but the craziest interview of all was with the local news-station… WLOX, you can see the footage if you go to www.wlox.com and then put in key word clowns… surprisingly, ours is the only article that comes up. There was also a wonderful photographer who spent a few days with us in Louisiana and you can see a few of those pictures atwww.joshuawolfe.com/cwb. Tomorrow, we return to New Orleans for a final show at the Jewish Community Center… one more day until I can wash my socks! Thank you all for your help, support and kind thoughts… it has really helped us spread some laughter! Renaissance Village: Baker, Louisiana. 12.30 pm. There are 583 trailers in this whitewashed gravel, very clean, well-security-ed compound. There is not a school, there are school buildings, but no funding for full-time teachers or even activity leaders. Most of the residents are from the Ninth Ward in New Orleans. Supposedly, the housing in Baker is temporary for 18 months, but they will probably be there for a few years. Our show was part of the Easter Extravaganza. The kids really enjoyed the show, but their energy was pretty crazy and sometimes it was a challenge to keep them seated. One of the security officers told us that our show was wonderful because everyone was engaged, both the adults and the children, and it was the first time he had seen that here. The face painting was a wonderful, rewarding part of the day. The kids loved it and got such amazing smiles on their faces when they looked in the mirror. Once they got the hang of it some of them began to paint each other. Children’s Hospital: New Orleans, Louisiana. 6.00pm. 20-30 people in the audience. Kids age 3-10 years old. Suzanne, the music therapist who set up the show for us, said that the hurricane was “definitely a life-changing experience.” Four days after the storm the whole hospital had to be evacuated and it was only possible due to the employees using their personal vehicles and one employee’s connection with the FBI to get them a plane. If they had had to wait for the National Guard they would have been at the bottom of the list because they didn’t have standing water, even though they were incredibly vulnerable and the situation in the city was getting dangerous. Most of the children were transported to Texas or Kansas City without their parents. About half of the kids were in wheelchairs and they all seemed to enjoy the show, a few were shy at first; but they were all participating by the end.